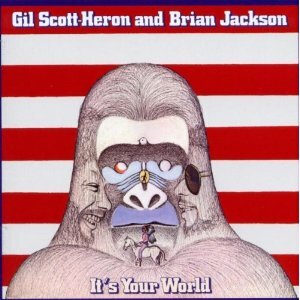 It’s Your World is a live album recorded by Gil Scott-Heron and Brian Jackson from concerts in Boston in July 1976. It also includes four tracks that were recorded in the studio. Most of the songs capture the jazzy, funky, soulful groove of Gil Scott-Heron which makes the messages in his songs so much more palatable than someone preaching at you. The sound is Latin percussion heavy, piano based and with saxophone and flute adding colour and texture. This entry was posted in 1970s Live Albums, Jazz Rock Live Albums, Singer Songwriter Live Albums, Soul Live Albums and tagged 1970s Songwriters, 1970s soul, 1976 live albums, Gil Scott-Heron Live Albums, SS S by Paul Simister. Bookmark the permalink.